Anous stolidus est tropica avis marina familiae Sternidarum. Maximus Anous, ab Anoo minuto arte conexo distinguitur magnitudine et pennis, quae sunt atrofuscae potius nigrae. Anous stolidus habet distributionem geographicam per omnem orbem terrarum, ab Havaiis ad Archipelagum Tuamotu et Australiam in Oceano Pacifico, a Mari Rubro ad Insulas Seisellenses et Australiam in Oceano Indico, et in Mari Caribico ad Insulas Tristanenses in Oceano Atlantico. Ea est colona, usitate in locis elevatis super rupes, vel in arboribus vel fruticibus nidificans. Femina singulum parit ovum quoque tempore nascendi. Insula Lady Elliot, Terrae Reginae, Australiae. Chardine, J. W., et R. D. Morris. 1996. 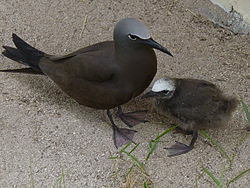 Brown Noddy (Anous stolidus). In The Birds of North America, No. 220, ed. A. Poole et F. Gill. Philadelphiae: The Academy of Natural Sciences; et Vasingtoniae: The American Ornithologists' Union. Handbook of the Birds of the World Vol 3, Josep del Hoyo editor, ISBN 84-87334-20-2. Harrison, Peter. 1983. Seabirds, an Identification Guide. ISBN 0-7470-1410-8. National Audubon Society. The Sibley Guide to Birds, by David Allen Sibley, ISBN 0-679-45122-6. National Geographic Society. Field Guide to the Birds of North America. ISBN 0-7922-6877-6. Vicimedia Communia plura habent quae ad Anoum stolidum spectant. Vide Anoum stolidum apud Vicispecies. BirdLife International (2004). Anous stolidus. 2006. IUCN Red List of Threatened Species. IUCN 2006. Novissima mutatio die 12 Aprilis 2013 hora 05:37 facta.